Muppets Most Wanted © 2013 Disney Enterprises, Inc.
Disney’s Muppets Most Wanted sees the whole Muppets gang on a grand world tour that takes an unexpected turn when they become involved with an international jewel thief who is a Kermit the Frog look-a-like. Starring alongside the Muppets gang is Ricky Gervais (The Office, The Invention of Lying) Ty Burrell (The Incredible Hulk, Dawn of the Dead), Tina Fey (30 Rock, Mean Girls), and Hugh Bonneville (Notting Hill, The Monuments Men). The Historic Dockyard in Chatham doubled as Berlin where Kermit decides to go for a lonely walk after having an argument with Miss Piggy. 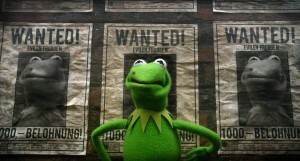 Upon entering a square he is duped by the evil Kermit look-a-like, leading to Kermit’s arrest. The Historic Dockyard in Chatham is set over 80 acres and contains over 100 Georgian and Victorian buildings. It is a popular filming location and has been used for productions such as Call the Midwife (2012-2014), Sherlock Holmes (2009) and Sherlock Holmes – Game of Shadows (2011). 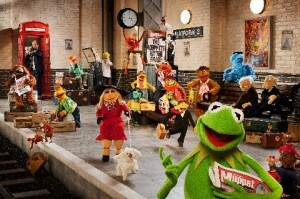 Don’t miss Muppets Most Wanted which is released in cinemas on 28 March 2014. This entry was posted in Filmed in Kent and tagged feature film, Hugh Bonneville, Muppets Most Wanted film locations, Ricky Gervais, The Historic Dockyard Chatham, Tina Fey, Ty Burrell. Bookmark the permalink.